July 4 is generally a day for barbecues, fireworks and reunions with old acquaintances to celebrate the greatest country on Earth- America. I chose to forgo most of the celebration, however, and have a decidedly less explosion-filled evening by attending the Death Cab for Cutie concert at the local college pavillion. Personally, I hate pavillion venues, especially when I get stuck with lawn seats as I did for this concert; luckily, the lawn made a minimal difference in the overall quality of my evening. First up were math rockers Maps & Atlases who are semi-notorious for having a sound on record that is difficult to translate into an effective live show. Most of the vocals sounded garbled and were occasionally drowned out by the heavy percussion- which was so loud that even the guitar lines were muted by comparison. The group, Dave Davison in particular, drew much ire from the lawn for sounding and looking very feminine. The band’s lack of stage presence certainly hurt them as well, although that level of observation was too deep for the peanut gallery it was fairly obvious that they were uncomfortable performing. A combination of showing up late and the quiet microphones made most of the songs unidentifiable but the group closed with “Solid Ground,” which actually turned out pretty well and set the stage perfectly for City and Colour. It was easy to forget that it was the Fourth of July in our secluded arena but Dallas Green made a point to remind us all what we were missing. The ex-Alexisonfire vocalist and devout Canadian greeted his Canadian brethren, who had made the pilgrimage from nearby Ontario, with a rousing “Happy Canada Day!” and the Americans with “Happy America Day!” and, lest we had chosen to ignore his wit, repeated it a few times for emphasis. Having already insulted roughly half of his fanbase, he then launched into “Coming Home,” and one of the most charming sets I’ve ever seen was under way. Green’s live performance when I saw him with Alexisonfire was decent but with City and Colour it was absolutely brilliant. He owned his half of the stage and even joined his bandmates on stage left for some of the extended instrumental sections. His guitar work was extremely precise and his voice never cracked- a true feat indeed for someone who frequents the upper register. Perhaps the best and most unexpected part of the set was the amount of City and Colour fans who were in the audience. I’ve always been a casual observer of the group but some, like the people on the blanket in front of us, had never heard of Death Cab and were there just to see Dallas & co. The atmosphere was no longer one of half-listening but of trance-like involvement, couples swaying on their blankets with their arms around each other, lonely girls with their heads bobbing, the entire venue singing the chorus to “Sleeping Sickness;” it almost made me forget that I was sitting on a wet lawn. The most memorable moment of the set, however, wasn’t because of great music but because a couple got engaged on the lawn rather close to me. The ensuing commotion forced Dallas to stop playing and, because we were so far away, he had no idea what the commotion was about. After a water bucket-style passing of information down the rows he congratulated the happy couple, albeit begrudgingly, and continued playing “Sorrowing Man.” Another highlight was the performance of “Grand Optimist,” which I was truly awestruck during. Before Death Cab’s set there was a decently heavy squall of rain that threatened to ruin the night entirely but, by some miracle, the second the MC called everyone back to their blankets the rain stopped. With the blanket just thick enough to prevent a soggy bottom, I was extremely content and ready for what was sure to be a great set. The show started out slow, with just Ben Gibbard taking the stage to perform “Lightness.” Then, with no fanfare, the rest of the band filtered out from backstage and they started into live epic “I Will Possess Your Heart.” It was about this time a friend of mine tried his best to ruin the evening by hitting on the girls in front of us and talking during “Crooked Teeth” but by this point I was so absorbed that there was no letting go. 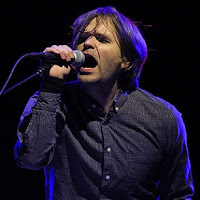 It’s important to note that I have never been more than a casual Death Cab For Cutie fan and yet, as they whizzed through songs from Narrow Stairs and Codes and Keys that I was hearing for the second time, I felt as though I had been listening to those songs for years. There was something strangely personal about the set, something that the distance from the stage and my unfamiliarity with the songs couldn’t offset. It could have been due to Ben Gibbard’s “aw shucks” stage presence- saying ‘thank you so much’ with each round of applause, making jokes about how his band will be producing the fireworks for us, his left knee that shook so much that I feared for the health of his hip- or that his band’s music sounds great no matter what the situation is. Jason McKerr’s drumming was particularly admirable, his tight beats held the entire set together, even when the sound cut out during “We Looked Like Giants,” his pounding kick drum kept the band and the audience engaged throughout as the sound team struggled to keep the music audible. As a whole, they performed the amazing feat of making a large venue seem small. The band did this in a variety of ways. The light show controlled the mood of the place startlingly well: vibrant yellows for “Crooked Teeth,” soft purples for “What Sarah Said,” a violent medley of red and orange for “Grapevine Fires,” without ever overwhelming the band. The setlist was predominantly a mixture of their four most recent albums but no song sounded out of place or forced; the quartet truly seemed to be enjoying themselves on stage. It also helped that there was the right amount of awe-striking moments- a synchronized drum interlude during “We Looked Like Giants,” “Marching Bands of Manhattan,” being unintentionally accented by fireworks, the lights blacking out during “The New Year,” the lawn standing up and grouping together to sing “I’ll Follow You Into the Dark,”- to keep everybody in the show, even those hellbent on securing phone numbers from out-of-town girls. When they closed with “Sound of Settling,” it was ironic because it signalled nobody settling but rather of group movement and unfettered glee. Everybody left the show with a grin on their face, knowing that although there were no fireworks, they had certainly witnessed an explosive performance.